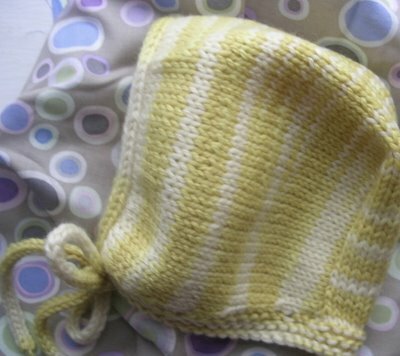 NOTES: I made this for the one month old daughter of a friend, so the much tigther gauge of my yarn was just right to produce a smaller bonnet than the one made with Kid Classic in LMKG. I used "ssk" instead of "slip one, knit one, psso" to work the decreases on the right edge and I picked up only 18 stitches instead of the 31 called for along each side of the bonnet to form the bottom garter stitch edge. I also picked up fewer stitches as I worked the applied i-cord edging so that the front would be a bit more closed. so sweet! and beautiful fabric! The weld & cochineal stripes! How very cute this is - I love how the colours go along together, and I'm sure the little recipient is going to love it! This is such a beautiful pattern . . . and you made it even better with your yarn and your knitting skills.